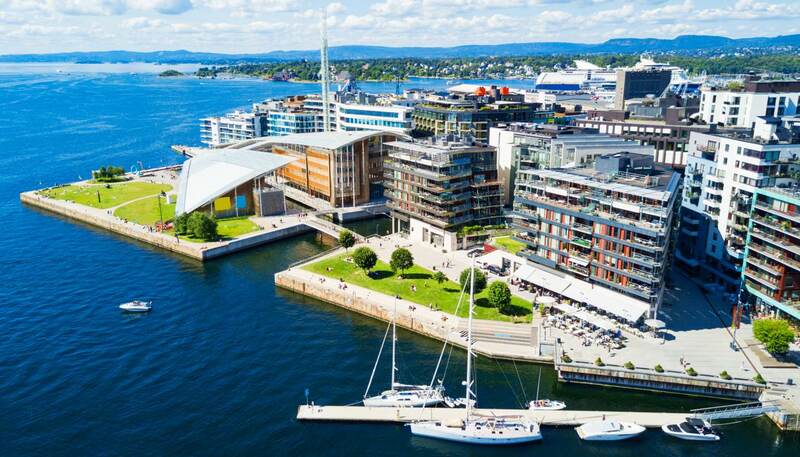 Oslo has a wide variety of places to stay, with big chains offset by smaller boutique establishments. As with everything else in the Norwegian capital, rates aren’t the cheapest but they always include a generous buffet breakfast. Hotels in and around the medieval quarter and harbour tend to be the most expensive, with more affordable accommodation found in the outer suburbs. The Norwegian capital also has a good selection of youth hostels, pensions and campsites for travellers on a budget. These Oslo hotel prices are for a twin or double bedroom per night, including breakfast for two and all taxes. The Bristol is a lavish, city centre hotel dating from the 1920s, though its rouge chesterfield sofas, wood panelled walls and glistening chandeliers make it appear much older. On offer are 251 rooms, alongside several restaurants and bars, and a fitness facility. It’s also located close to many of the main attractions. Telephone: +47 2 282 6000. The Continental is an Oslo institution that has been run by the same family for four generations and is more than a century old. Situated in the heart of Oslo, next to the National Theatre, the hotel is known both for outstanding service and restaurants as well as its links with the Oslo arts scene. Telephone: +47 2 282 4000. One of the most charming of Oslo’s stays, the Grims Grenka might be a chain hotel but it has the feel of a boutique establishment. Each of the 65 rooms are spacious and come with a stash of organic tea. The Madu restaurant and the rooftop Q Lounge are both worth checking out too. Telephone: +47 2 310 7200. Built in the 1890s, the intimate Saga Hotel sits a stone's throw from the Royal Palace but is far less grand than its setting would suggest. Instead, its rooms are romantic and remarkably short on Scandinavian minimalism, while staff are friendly and ever-ready to field questions and source decent restaurants. Telephone: +47 2 255 4490. 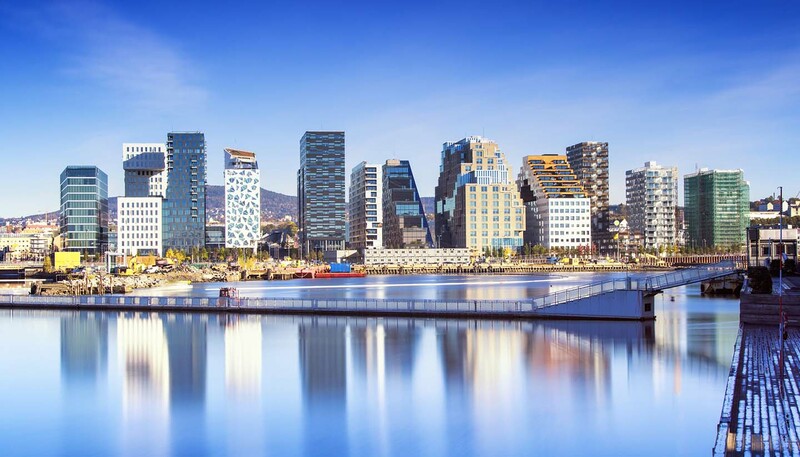 Despite the name, The Thief is a well-priced hotel with direct access to the Oslofjord that certainly won't relieve you of all your money. Housed in a modern glass and steel building, the rooms have great views and simple modern décor. There's a gourmet restaurant on site too. Telephone: +47 2 400 4000. The décor isn’t much to write home about, but who cares? The Anker is a budget hotel in a central location, which (by Oslo standards) makes it an extremely decent bargain indeed. Rooms are comfortable, modern and clean – and perfectly placed for falling into after a night out in the hip Grünerløkka neighbourhood. Telephone: +47 2 299 7510. Despite the 1930s facade (and the name), the First Hotel Millennium opened in 1988 and is located a few minutes' walk from the city centre. Its 114 rooms are finished in minimal Scandinavian style with wooden floors. The on-site restaurant does a decent breakfast buffet too. Telephone: +47 2 102 2800. Centrally located and a short walk from Oslo’s main shopping street and central station the Thon Hotel Astoria is convenient for budget-minded travellers who want to explore Oslo’s tourist attractions. Rooms are comfortable – if small – and the excellent breakfast is highly recommended. Telephone: +47 24 14 55 50.